For over 60 years The Food Executive Club of Vancouver has served the vendor and retailer community in British Columbia. 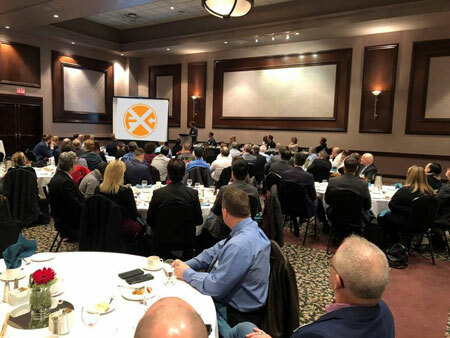 Connecting top executives from Canadian retail banners to the leading consumer product sales and marketing executives in the West, FECOV has built the strongest industry community in Canada through engaging and enlightening presentations, social events and activities. Club membership is open to manufacturers, distributors, and service providers to the Food, Grocery, Drug, Beverage Alcohol and Food Service industries. The foundation of the club is built on monthly luncheons where retailers can address common issues, make announcements, and outline what their company is up to. The advantage to the retailer is that they can address the top supplier executives at one time. As well, the events are fun, entertaining and a great networking opportunity for all involved. Occasionally additional speakers are arranged, for example the Canadian Federation of Independent Grocers, leading industry professionals from related industry verticals, professional sport team leaders, or other speakers of interest to the FECOV members and their guests. Luncheons and social events occur monthly with a typical year including eight luncheons, a curling bonspiel, a golf tournament and a year-end gala. Some recent FECOV guest speakers include (in alphabetical order) - 7-11, Buy-Low Foods, Canada Safeway, Choices Market, Cooper's Foods, Costco Wholesale, HY Louie, London Drugs, Lululemon, Nielsen, Overwaitea Food Group, Quality Foods, T&T Markets and Thrifty Foods and others. For more information on membership, upcoming events or luncheons, please review our site or get in touch with any of the board members.